Our school is closed all week due to the massive snow storm that hit us... hooray! BUT, yes, there is a but, I had a bunch of things I planned to do this week to wrap up my room for the holiday break and I am NOT GOOD at letting to-do's go. Knowing I'm not the only to-doer in the school, my principal came in today to open the building for us. As I am busily printing off report cards and end-of-month newsletters, Christmas music comes blasting over the P.A. system. 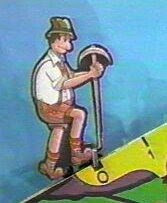 I feel like that mountain climber from the Price is Right this morning. Yesterday felt like a Thursday (and you know how I feel about Thursdays) so today should be Friday, but it's not. It's Wednesday. I feel like I'm hiking up the tallest mountain with no end in sight. My kids are whipped into a pre-holiday frenzy just as I am winding down from 2nd quarter and dreaming of lazy mornings in my jammies. Excellent combo. My bad boys have gone UBER-BAD. I have said "REALLY?!" many times with a look of disbelief (mouth hanging open, teacher-bug-eyes). "REALLY?! You thought that tackling your friend on the carpet during shared reading was a good choice?" "REALLY?! May I ask why you're attempting break dancing, circa 1985, while we're trying to line up?" My "problem children" are simply off the reservation. And the kids in-between you ask? They're watching from the sidelines practically cheering on their classmates. Their little eyes are shining with, "ooohhh, awesome. Did you see what she did?! Let's see what the teacher does! Oooh this is going to be good!!" There is one little shining light however, my little one that tends to drive me BSC seems to have calmed down. I think she has found her chi on a little island surrounded by chaos. Sadly I am sure this is what her home life is like so our classroom is simply an extension of what her "normal" is... but frankly, I'll take it right now. If she joined in the Lord of the Flies-type behavior my other lovies are experimenting with, you might find me crouched in the castle on the playground rocking furiously. Have you ever heard that 5 year olds are very literal? Trust me, they are. We spent 5 full minutes debating whether or not Dr. Seuss knew what he was talking about, because the 4 "things" on the left might be tall, but the 2nd one in is shorter than the others, so they are not all tall. I tried, many times, to show that Dr. Seuss meant that the 4 on the left were all tall compared to the 4 on the right. "But they're NOT ALL TALL! There is one that is tall and the others are shorter! Dr. Seuss is wrong!" Long exhale... what do I do with this? Yes, you're right in the literal sense, but this is Dr. Seuss, he writes SILLY books that don't make sense. 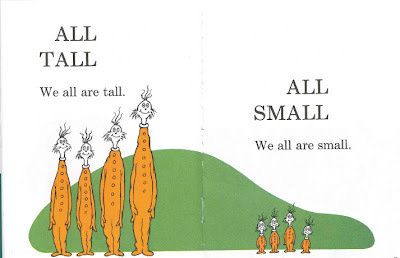 Again, I explain, Dr. Seuss is talking about ALL of them, not just the TALL ones. I say this over and over, many different ways. No luck. We're literally stuck on this page. Finally, one of my lovies shots out, "Can we just turn the page?!" Yes sweetie, we can. Thanks goodness. Ah, who doesn't love 5 year olds?! I never get a "bad case of the Mondays," but let me tell you, I get whopping cases of the Thursdays. Holy moly. My special is in the afternoon on Thursdays which means my little lovies are with me from 8:30 - 12:25. That. Is. A. Long. Time. Here's to Friday. Always better than Thursday. I HEART collaboration. For me to embrace this as much as I do can come as a shock because I've always been a just-let-me-do-it kind of gal. I'm not saying that's a good philosophy, but it's one that I haven't ever been able to shake. During my student teaching I taught on two VERY different teams. One team collaborated for all the academic areas. There wasn't one part of the day, outside of morning meeting, where I hadn't planned with another teacher. From a student teacher perspective, the support was great, but the empowerment of being treated as an equal with good ideas was even better. The other team I taught on openly hated each other, so there was zero collaboration. I thoroughly enjoyed teaching both grade levels, but did miss the cohesiveness of the collaborative team. My first two years as an "official" kindergarten teacher had some collaboration, but not as much as I'd like. Then this year I was blessed to have a fantastic co-teacher in my room for Reading Workshop. Our planning meetings have become these sessions where great ideas just pop out, or good ideas poke their head out and then we excitedly talk them into great ideas. RW has become my favorite part of the day, and in turn, my kiddos really like it. Our literacy specialist came into my room this morning for a meeting whose purpose was to arrange a time when she could come into my classroom, observe Language Arts, and then participate by co-teaching. This turned into a fantastic planning session for my Writing Workshop, and when she left I had a week-long focus lesson that I was giddy with excitement about. Collaboration seems like a no-brainer, a home-run, a slam-dunk, but if every single person is not 100% on board, it's very difficult to make happen. I'm here to say that if you are a I'd-rather-go-it-on-my-own kind of teacher, you are really missing out. Today was a rather squirrely Friday. My class didn't seem to have the ability to use an indoor voice at all so we were just LOUD, all day long. 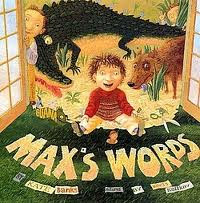 LOUD during morning networking, LOUD during reading workshop, LOUD during quiet story time (I know, right?!) and yes, of course, LOUD during choice time. I gave some reminders, I gave some "you know better than this," and I gave some death glares. Then I gave up. They were productive and on task, just LOUD. 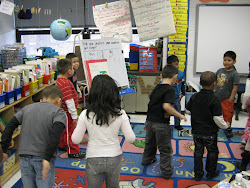 During choice time, one of my sweethearts was singing "This little light of mine... I'm gonna let it shine... this little light of mine... I'm gonna let it shine..." Nostalgia waved over me. I really love that song. I immediately went to my laptop and opened i-Tunes, fully prepared to make a quick purchase. I discovered that we have a CD with that song on it so I marched over to the CD player without telling anyone what I was doing and put the song on. Almost immediately, my LOUD group of children were singing with all their hearts. I sang along and found myself tearing up a bit. We played it 3 more times. I'm not sure if all school districts do this, but when our kids have picture day, so do we. I don't know any teacher that has opted to buy a photo package with the country brook in the background, or the disco lights like my husband's 8th grade photo (still hysterical!) but we always receive a sheet of our mug with the traditional blue background. Every year I stick it with the previous year's photos... this morning I received this year's in my mailbox and had my annual self-discussion, "what could I do with these?" Now I have the answer!